MicroRNAs (miRNAs) are essential for podocyte homeostasis, and the miR-30 family may be responsible for this action. However, the exact roles and clinical relevance of miR-30s remain unknown. In this study, we examined the expression of the miR-30 family in the podocytes of patients with FSGS and found that all members are downregulated. Treating cultured human podocytes with TGF-β, LPS, or puromycin aminonucleoside (PAN) also downregulated the miR-30 family. 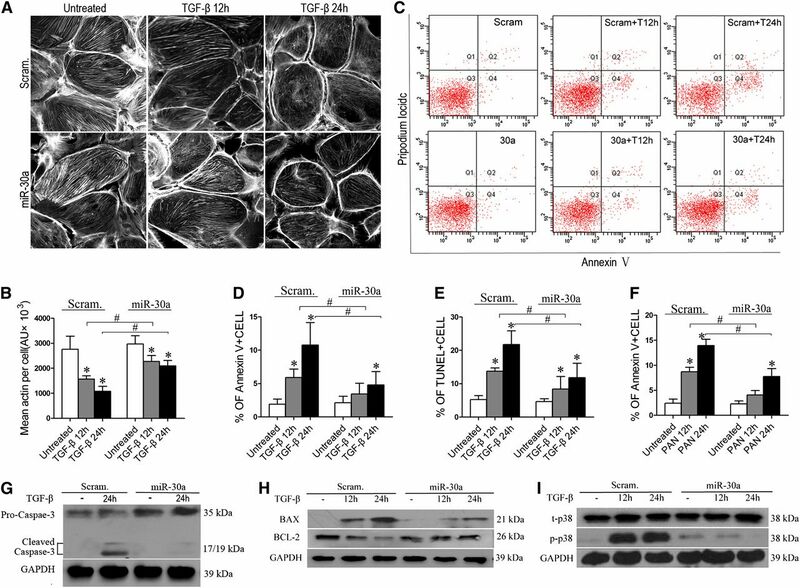 Podocyte cytoskeletal damage and apoptosis caused by treatment with TGF-β or PAN were ameliorated by exogenous miR-30 expression and aggravated by miR-30 knockdown. Moreover, we found that miR-30s exert their protective roles by direct inhibition of Notch1 and p53, which mediate podocyte injury. 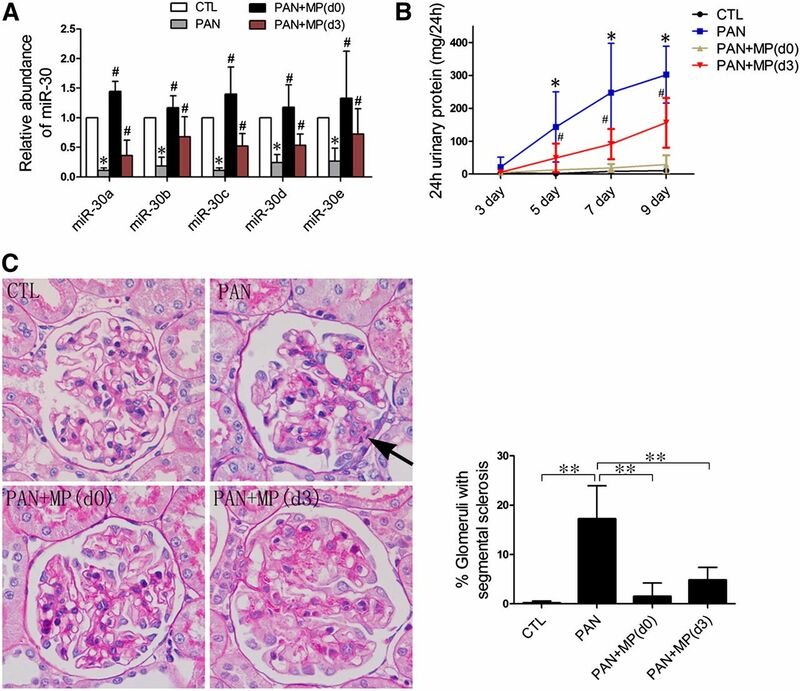 In rats, treatment with PAN substantially downregulated podocyte miR-30s and induced proteinuria and podocyte injury; however, transfer of exogenous miR-30a to podocytes of PAN-treated rats ameliorated proteinuria and podocyte injury and reduced Notch1 activation. Finally, we demonstrated that glucocorticoid treatment maintains miR-30 expression in cultured podocytes treated with TGF-β, LPS, or PAN and in the podocytes of PAN-treated rats. Glucocorticoid-sustained miR-30 expression associated with reduced Notch1 activation and alleviated podocyte damage. Taken together, these findings demonstrate that miR-30s protect podocytes by targeting Notch1 and p53 and that the loss of miR-30s facilitates podocyte injury. In addition, sustained miR-30 expression may be a novel mechanism underlying the therapeutic effectiveness of glucocorticoids in treating podocytopathy. Accumulating evidence demonstrates that microRNAs (miRNAs), a group of small noncoding RNAs, can regulate gene expression at the post-transcriptional level.1 More than a thousand different miRNA genes have been identified in the mammalian genome, and each miRNA can target hundreds of genes.2,3 Therefore, miRNAs provide a layer of gene expression regulation and are involved in almost every aspect of the cellular and molecular processes in a variety of cell types, including renal cells. Renal cell-specific deletions of Dicer, an RNase III enzyme required for miRNA biogenesis, reveal the essential roles played by miRNAs in renal cells, including podocytes,4–6 juxtaglomerular cells,7 and tubular epithelial cells.8 miR-192 promotes collagen production in glomerular mesangial cells in experimental diabetic nephropathy9 and mediates TGF-β/Smad3–induced tubulointerstitial fibrosis.10 In experimental diabetic nephropathy models, miR-192, miR-216, and miR-217 mediate the hypertrophy of glomerular mesangial cells.11 Moreover, miR-93 can modulate glomerular injury through vascular endothelial growth factor.12 By targeting BCL2, miR-195 was shown to promote podocyte apoptosis in cultured podocytes.13 Although these studies provide some insight into the effects of miRNAs on the kidneys, increased efforts must be made to understand the role of miRNAs in kidney pathophysiology. The miR-30 family is evolutionarily conserved and consists of five members, miR-30a through miR-30e. miR-30s are reportedly involved in several cellular processes, including tumor invasion and the metastasis of liver cancer cells,14 inhibition of cardiomyocyte apoptosis,15 the apoptosis and self-renewal disruption of breast tumor-initiating cells,16 tumor cell autophagy,17 pronephros development in Xenopus,18 adipogenesis,19 cellular senescence,20 and the epithelial-to-mesenchymal transition of hepatocytes.21 Despite these studies, the functions of miR-30s remain largely unknown, particularly in relation to kidney disease. The miR-30 family is abundantly expressed in podocytes in contrast to other glomerular cell types in mice,5 and it likely plays a role in modulating podocyte physiology and pathologenesis. Glomerular gene expression profiling of mice with Dicer deleted selectively in podocytes identified a group of upregulated genes, among which predicted targets of miR-30s were predominantly enriched.6 This finding suggests that miR-30s may regulate gene expression, thereby functioning in podocytes. Our bioinformatics analyses of predicted miR-30 targets have revealed signaling pathways that may be targeted by miR-30 (our unpublished data). Among these pathways, the Notch,22,23 p53,22,24 Wnt/β-catenin,25 and actin cytoskeleton26 pathways are known to be involved in podocyte injury, which suggests that miR-30 may be involved in podocyte injury. In this study, we examined the role and underlying mechanism of miR-30s in podocyte injury. We found that miR-30 family members are expressed in human glomerular podocytes and downregulated in patients with FSGS. They are also downregulated in cultured podocytes that have been treated with TGF-β, PAN, or LPS. We further demonstrate that miR-30s protect podocytes by targeting Notch1 and p53, and downregulation of miR-30s results in the enhanced signaling of Notch1 and p53, leading to podocyte injury. Importantly, downregulation of miR-30 can be prevented by glucocorticoids. Thus, we have identified miR-30s as novel players in podocyte injury, which may be pharmacologically targeted during podocytopathy treatment. A previous study found that miR-30a is specifically expressed in mouse glomerular podocytes.5 To determine whether miR-30 family members are also expressed in human podocytes, we performed quantitative PCR (qPCR) with RNA from isolated human glomeruli and detected their presence (Figure 1A). In addition, in situ hybridizations of miR-30a and miR-30d with locked nucleic acid (LNA) probes (Exiqon, Vedbaek, Denmark) confirmed the abundant expression of both in podocytes (Figure 1, B and C). Therefore, abundant expression of miR-30s in podocytes is evolutionarily conserved. miR-30s are expressed in human glomerular podocytes and downregulated in patients with FSGS. (A) qRT-PCR quantifications of the miR-30s in the microdissected glomeruli from 16 patients with FSGS and 6 normal controls. Black triangles and red dots represent normal controls (NC) and patients with FSGS, respectively, and indicate their relative miR-30 abundance in the glomeruli. The black and red lines represent the means of miR-30 abundance in the NC and FSGS groups, respectively. Statistical significance (P<0.05) is present between the control and FSGS groups for all miR-30 family members. (B) In situ hybridization of miR-30a and miR-30d with renal biopsies of patients with FSGS and normal controls (CTL). Black arrows indicate normal podocytes with abundant miR-30 expression, white arrows indicate sclerotic areas with a reduced miR-30 expression, and yellow arrows indicate parietal epithelial cells that also express miR-30. (C) Quantification of in situ hybridization results in B. *P<0.05. To evaluate the clinical relevance of miR-30s, qPCR or in situ hybridization of miR-30s was performed with biopsies from 16 FSGS and 6 renal carcinoma patients (normal tissue from nephrectomized kidney). We found that all five members of the miR-30 family were downregulated in the glomeruli of patients with FSGS (Figure 1A). In situ hybridization of miR-30a and miR-30d was consistent with the results obtained (Figures 1, B and C). To preclude the possibility that the miR-30 reduction was due to podocyte loss in these patients, we counted the podocytes of these patients and controls, and found that the FSGS group had an approximately 18.5% loss of podocytes compared with the control group (701.5±103.2 versus 861.3±132.3 per glomerulus). Thus, the qPCR results in Figure 1A were normalized with these numbers, and a significant difference in miR-30 level was still present between the FSGS and control groups (Supplemental Figure 1). 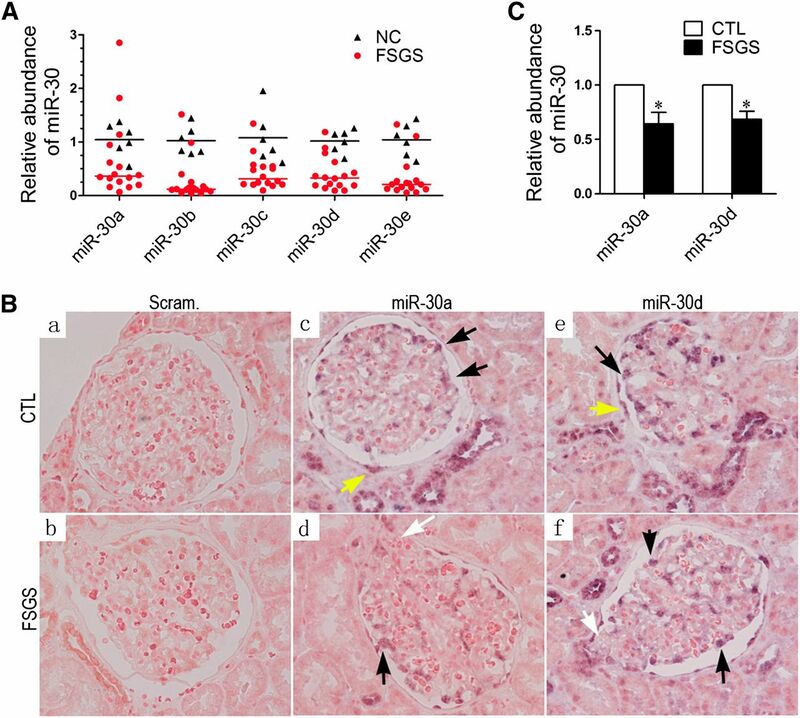 Because miR-30s are downregulated in the podocytes of patients with FSGS, a disease that can be induced by a number of deleterious factors, we speculated that these factors may cause miR-30 downregulation. To test this theory, we treated human podocytes with TGF-β, IL-4, PAN, LPS, and TNF-α and found that TGF-β, LPS, and PAN, but not TNF-α or IL-4, significantly downregulated all five miR-30 family members as shown by qRT-PCR (Figure 2, data not shown). miR-30 family members are downregulated in cultured human podocytes treated with TGF-β, PAN, and LPS, respectively. (A) qRT-PCR analyses of miR-30a through miR-30e in podocytes treated with TGF-β (5 ng/ml) for 1, 6, 12, and 24 hours, respectively, demonstrating that all miR-30 members are downregulated by TGF-β. (B and C) qRT-PCR analyses of miR-30s in podocytes treated with PAN (50 µg/ml) (B) or LPS (10 µg/ml) (C) for 12 or 24 hours. The data are expressed as the mean ± SD of three independent experiments. *P<0.05 versus untreated control. To determine the effect of miR-30 downregulation on podocyte injury, we constructed a podocyte cell line that stably expresses exogenous miR-30a (designated as “miR-30a” podocytes) to maintain the miR-30 level during TGF-β or PAN treatment. We also prepared a podocyte line that stably expresses Scramble miR as a control (designated “Scram” podocytes). The qPCR analysis demonstrated that the total miR-30 level (endogenous and exogenous) was successfully maintained in the miR-30a podocytes after TGF-β treatment (Supplemental Figure 2). We examined podocyte cytoskeletons using fluorescein-conjugated phalloidin staining after TGF-β or PAN treatment and found that miR-30a podocytes exhibited significantly less severe cytoskeletal damage than Scram podocytes (Figure 3, A and B), demonstrating that miR-30a protects podocyte cytoskeletons. Exogenous miR-30a protects podocytes from cytoskeletal damage and apoptosis induced by TGF-β or PAN. (A) Fluorescein-conjugated phalloidin staining of stably transfected Scram or miR-30a podocytes after treatment with TGF-β (5 ng/ml). (B) Quantification of results in A. (C) Annexin V flow cytometry of Scram or miR-30a podocytes after TGF-β treatment for 12 or 24 hours. (D) Quantification of results in C. (E) TUNEL assay of the cells as in C. Each bar represents the mean ± SD of the percentages of apoptotic cells in 30 high-power fields. (F) Annexin V flow cytometry of Scram or miR-30a podocytes after PAN treatment (50 µg/ml) for 12 or 24 hours. (G–I) Immunoblotting of cleaved caspase 3 (G), BAX and BCL2 (H), and p38 (t-p38) and phosphorylated p38 (p-p38) (I) in the Scram and miR-30a podocytes after TGF-β treatment for the indicated time. All data are presented as the mean ± SD of three independent experiments. *P<0.05 versus untreated control; #P<0.05. In addition, miR-30a podocytes had a significantly lower percentage of Annexin V–positive apoptotic cells than did Scram podocytes after treatment with TGF-β for 12 or 24 hours (Figure 3, C and D), indicating that miR-30a is antiapoptotic in podocytes. Terminal deoxynucleotidyl transferase–mediated digoxigenin-deoxyuridine nick-end labeling (TUNEL) assays showed the same results (Figure 3E and Supplemental Figure 3). In addition, miR-30a podocytes also exhibited resistance to apoptosis induced by PAN (Figure 3F). TGF-β activated caspase 3 in Scram podocytes but not miR-30a podocytes (Figure 3G). Proapoptotic BAX was greatly upregulated in Scram podocytes but less so in miR-30a podocytes, and antiapoptotic BCL2 behaved oppositely (Figure 3H). In addition, activation/phosphorylation of p38, a known downstream mediator of podocyte apoptosis, was almost completely inhibited in TGF-β–treated miR-30a podocytes (Figure 3I). Together, these results support the concept that miR-30a prevents podocyte apoptosis. To further support the notion of a protective role for miR-30s in podocytes, we knocked down all five miR-30 family members in podocytes using the miR-30 “Sponge”27 and found that the number of stress fibers in the podocytes was reduced, even in the absence of TGF-β (Figure 4, A and B). A more prominent stress fiber loss was observed in the miR-30 Sponge-transfected cells that were treated with TGF-β (Figure 4, A and B). 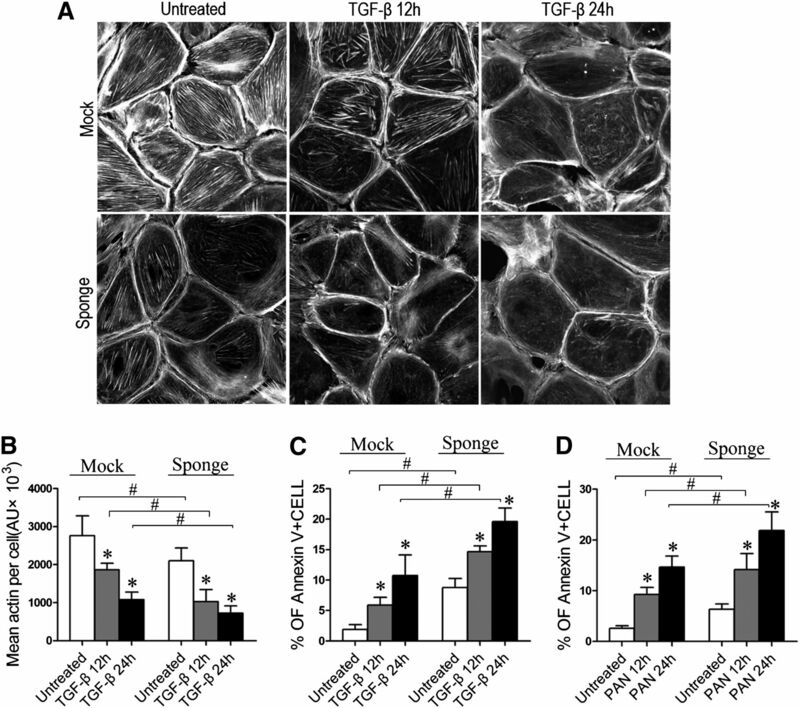 The podocytes transfected with the miR-30 Sponge also exhibited significantly increased levels of apoptosis compared with the Mock-transfected control cells in the absence or presence of TGF-β or PAN (Figures 4, C and D). miR-30 knockdown by Sponge led to increased expression of BAX and decreased expression of BCL2 (Supplemental Figure 4A). miR-30 knockdown by Sponge damages the podocytes directly or aggravated the damage induced by TGF-β or PAN. (A) F-actin staining with phalloidin in the podocytes transiently transfected with or without miR-30 Sponge after TGF-β treatment for 12 and 24 hours. (B) Quantification of the stress fibers in A. (C and D) Annexin V flow cytometry of podocytes transiently transfected with vector (Mock) or miR-30 Sponge and treated with PAN (50 µg/ml) (C) or TGF-β (5 ng/ml) (D) for 12 or 24 hours. The percentages of Annexin V-positive cells are shown in the graph on the right, and each bar represents the mean ± SD (expressed in arbitrary units of stress fiber intensity) of triplicate experiments. *P<0.05 versus untreated control; #P<0.05. To explore the mechanism underlying the protective effects of miR-30 on podocytes, we searched the putative targets for miR-30 using TargetScan and PicTar, two miRNA target analyzing databases, and predicted Notch1 as a miR-30 target (Figure 5A). Notch1 has been shown to mediate podocyte injury,22,23 and we have also observed Notch1 activation in the podocytes of patients with FSGS (Supplemental Figure 5, A and C). We therefore wondered whether miR-30s protect podocytes by directly inhibiting Notch1. We treated Scram and miR-30a podocytes with TGF-β and found that TGF-β activated Notch1 in Scram podocytes but not in miR-30a podocytes (Figure 5B and Supplemental Figure 5B). Other Notch signaling pathway components, such as Jagged1, HES1, and HEY1, were partially inhibited in the miR-30a podocytes (Supplemental Figure 5D). Notch1 is a direct target of miR-30s. (A) The predicted miR-30 binding site in the Notch1 3′UTR (Targetscan) and the point mutations (G-T, U-T, and A-C) made in the region corresponding to the miR-30 seed sequence to create a mutant Notch1 3′-UTR for the luciferase reporter construction. (B) Immunoblotting of Notch1 intracellular domain (NICD) in Scram or miR-30a podocytes after TGF-β treatment for the time indicated. (C) Immunoblotting of the full-length (FL) or the transmembrane domain (TM) of Notch1 with Scram or miR-30a podocytes after TGF-β treatment. (D) Immunoblotting of FL and TM Notch1 with podocytes transiently transfected with Mock or miR-30 Sponge after TGF-β treatment for 24 hours. (E) Immunoblotting of FL and TM Notch1 with the podocytes transfected with the Scramble miR- (Scram.) or miR-30c to miR-30d (miR-30cd)–expressing construct after TGF-β treatment for 24 hours. (F) Luciferase assays of the podocytes cotransfected with each luciferase reporter and Scramble miR or miR-30 precursors. (G) The luciferase assay demonstrates that the wild-type reporter has increased activity in the cells transiently transfected with miR-30 Sponge but not in those treated with the mutant reporter. All data are presented as the mean ± SD of three independent experiments. In A–E and G, *P<0.05 versus untreated control. #P<0.05; in F, *P<0.05 versus Scramble miR-transfected cells. A reciprocal relationship between Notch1 protein concentrations and miR-30 levels was observed, i.e., full-length or transmembrane Notch1 protein was significantly less abundant in miR-30a podocytes than in Scram podocytes, regardless of the absence or presence of TGF-β (Figure 5C). Conversely, in the cells transfected with miR-30 Sponge, these forms of Notch1 protein were more abundant than in the “Mock” transfected control cells in the absence or presence of TGF-β (Figure 5D). In addition to miR-30a, overexpression of miR-30c and miR-30d also reduced Notch1 protein in the podocytes (Figure 5E). To confirm that Notch1 is a direct target of miR-30, we performed luciferase reporter assays using reporters carrying either the wild-type 3′-untranslated region (UTR) of human Notch1 or a mutant with three nucleotides swapped in the region corresponding to the miR-30 “seed” (Figure 5A). When cotransfected with synthetic miR-30 precursors (miR-30a, b, c, d, or e) into podocytes, the wild-type reporter exhibited reduced luciferase activity, but the mutant did not (Figure 5F). Moreover, the wild-type reporter, but not the mutant, yielded a higher luciferase activity in the miR-30 Sponge-transfected cells than in the Mock control cells (Figure 5G). These results demonstrate that Notch1 is a direct target of miR-30s. p53 is known to be involved in podocyte apoptosis,22,24 and miR-30s have recently been shown to directly target p53 in human cardiomyocytes and prevent their apoptosis.15 To determine whether miR-30s also inhibit p53 in podocytes, thereby blocking the apoptosis pathway, we treated Scram and miR-30a podocytes and found that the levels of both p53 and phosphorylated p53 were lower in the latter in the absence or presence of TGF-β (Figure 6A). Conversely, in the podocytes transfected with miR-30 Sponge, the levels of both p53 and phosphorylated p53 proteins were increased dramatically compared with those in the Mock-transfected cells in the presence or absence of TGF-β (Figure 6B). Increased expression of p53 was observed in the podocytes of both patients with FSGS and PAN-treated rats (Supplemental Figure 6, A and B), but the increase of p53 expression in podocytes was attenuated in the rats that received exogenous miR-30a by gene transfer (Supplemental Figure 6B). Moreover, qRT-PCR analyses showed that p53 downstream molecules, BAX, CDKN1A, and FAS, in the glomeruli of patients with FSGS and in TGF-β–treated podocytes, were all upregulated (Supplemental Figure 6, C and D). These data demonstrate that miR-30s also inhibit p53 in podocytes. miR-30s inhibits p53 in human podocytes. (A) Immunoblotting of p53 and phosphorylated p53 with Scram and miR-30a podocytes after TGF-β treatment for the time indicated. Quantifications of the blots are shown on the right. (B) Immunoblotting of p53 and phosphorylated p53 (p-p53) with podocytes transiently transfected with empty vector (Mock) or miR-30 Sponge followed by TGF-β treatment. Quantifications of the results are shown on the right. *P<0.05 versus untreated control; #P<0.05. Previous studies have shown that glucocorticoids protect podocytes and are effective for podocytopathy.24,28 On the basis of our findings that miR-30s protect podocytes but are downregulated in disease conditions, we speculated that glucocorticoids might exert their therapeutic effect by sustaining miR-30s in podocytes. We then treated podocytes with TGF-β, PAN, or LPS in the presence or absence of glucocorticoids (dexamethasone) and found that dexamethasone prevented downregulation of all miR-30 family members during the treatments (Figures 7, A and B, and Supplemental Figure 7). The prevention of miR-30 downregulation by dexamethasone was accompanied by the reduced apoptosis of podocytes treated with either TGF-β or PAN (Figure 7, C and D, respectively). To rule out the possibility that the protective effect of dexamethasone on podocytes was independent of the maintenance of miR-30 expression by dexamethasone, we transiently transfected the podocytes with miR-30 Sponge to deplete miR-30 and found that miR-30 knockdown led to a reduction of protective efficacy of dexamethasone on podocytes that were treated with TGF-β or PAN (Figure 7, C and D, respectively). Dexamethasone treatment also reversed the elevation of BAX level and the reduction of BCL2 and CD2AP levels in podocytes induced by PAN (Figure 7E and Supplemental Figure 4B). These data suggest that maintaining miR-30 expression may be a novel mechanism underlying the protective effect of glucocorticoids on cultured podocytes and their therapeutic effectiveness in treating podocytopathy. Glucocorticoid (DEX) prevents downregulation of miR-30s and ameliorated podocyte injury. (A and B) qRT-PCR analysis of miR-30s in the podocytes treated with TGF-β (A) and PAN (B) in the presence or absence of DEX. (C and D) Annexin V flow cytometry analyses of the podocytes transfected with miR-30 Sponge or vehicle, followed by treatment of TGF-β (C) or PAN (D) in the absence or presence of DEX. 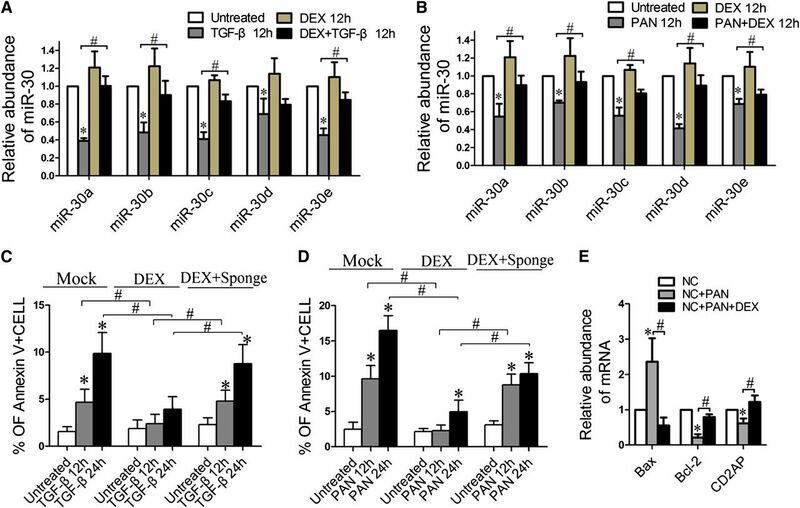 The results show that DEX reduces podocyte apoptosis induced by TGF-β or PAN through sustaining miR-30 expression. (E) qRT-PCR analysis of BAX, BCL2, or CD2AP expression in cells treated with PAN in the presence or absence of DEX. All data are expressed as the mean ± SD of three independent experiments. *P<0.05 versus untreated control; #P<0.05. DEX, dexamethasone. Characterization of PAN-treated rats with either Scramble miR or miR-30a transfer. Scramble miR or miR-30 transfer is performed every 3 days. Day 0 is defined as the day when PAN injection and the first miR-30a transfer are conducted. (A) qPCR analysis of miR-30a in the glomeruli of untreated rats (CTL) or PAN-treated rats, immediately followed by Scramble miR (PAN + Scram) or miR-30a transfer (PAN + miR-30a) (n=9 in each group) at day 9, demonstrating that miR-30a is downregulated by PAN, but exogenous miR-30a transfer maintains the level of miR-30a in the podocytes/glomeruli of the rats. (B) Twenty-four hour urinary protein levels in rats in A. *P<0.05 versus the PAN + Scram group. (C) Periodic acid–Schiff staining of kidney sections of the rats at day 9, showing sclerotic lesions (arrows) in PAN + Scram rats, which were ameliorated in PAN + miR-30a rats. One hundred glomeruli of each rat were examined for sclerotic lesions, and the percentage of sclerotic glomeruli of each group of rats is shown on the right (n=9). #P<0.05. (D–G) Representative electron microscopy images (D), immunofluorescence staining of podocin (E), immunohistochemical staining of Notch1 intracellular domain (NICD) (F), and TUNEL assay (G) of the glomeruli in PAN + Scram and PAN + miR-30a rats, demonstrating an ameliorated foot process effacement (yellow asterisks), less affected podocin expression, reduced Notch1 activation, and less severe apoptosis (arrows) in the latter. **P<0.05. Characterization of PAN-treated rats with or without glucocorticoid (MP) treatment. (A) qPCR analyses of miR-30s with isolated glomeruli from rats that are treated with vehicle (CTL), PAN, or PAN followed by MP (PAN + MP) from day 0 through day 9 (d0), or from day 3 through day 9 (d3) (n=6 in each group). The glomeruli are isolated at day 9 after PAN injection. *P<0.05 versus CTL; #P<0.05 versus PAN. (B) Twenty-four hour urinary protein levels of rats at days 3, 5, 7, and 9, demonstrating that MP prevents PAN-induced proteinuria. *P<0.05 versus CTL; #P<0.05 versus PAN. (C) Periodic acid–Schiff staining of rat kidneys at day 9 after PAN injection. Arrows denote sclerotic lesions in the glomeruli. Quantification of glomerular lesions of these rats is shown on the right. **P<0.05. MP, methylprednisolone. To sustain miR-30 levels in the podocytes of PAN-treated rats, we transferred a miR-30a–expressing construct to podocytes using TransIT in vivo gene delivery system (Mirus).29 miR-30a levels were well maintained in the glomeruli of PAN-treated rats undergoing the transfer (Figure 8A). To localize the delivered miR-30a in the glomeruli, miR-30a in situ hybridization was performed with the kidneys from the rats subjected to PAN treatment and miR-30a transfer. The results showed that the increased miR-30a was present in podocytes as well as tubular cells (Supplemental Figure 9A). To further show that an exogenous gene can be delivered to podocytes by the method, we injected the DNA of a mutant miR-21–expressing plasmid to the rats and performed in situ hybridization on the kidneys using a probe specific for the mutant miR-21. We found that mutant miR-21 was clearly present in the podocytes as well as in the tubular cells (Supplemental Figure 9B). Electron microscopic in situ hybridization for mutant miR-21 confirmed this result (Supplemental Figure 9C). The rats with miR-30a transfers exhibited reduced proteinuria (Figure 8B), glomerulosclerosis (Figure 8C), foot process effacement (Figure 8D), Notch1 activation (Figure 8F), and cell apoptosis (Figure 8G) but more stable podocin expression (Figure 8E) in the podocytes compared with those to which Scramble miR had been transferred. Blood laboratory results were consistent with these observations (Supplemental Figure 8). To test whether glucocorticoids are also capable of maintaining miR-30 expression in the podocytes of PAN-treated rats, and thereby preventing or reducing proteinuria, we treated rats with methylprednisolone starting either from day 0 (when methylprednisolone was injected) or from day 3 after PAN injection. We found that methylprednisolone treatment from day 0 completely prevented miR-30 downregulation, whereas the treatment from day 3 partially retained miR-30 levels (Figure 9A). As expected, methylprednisolone treatment from day 0 almost completely protected rats from proteinuria (Figure 9B), glomerulosclerosis (Figure 9C), foot process effacement, podocin expression, Notch1 activation, and apoptosis (Supplemental Figure 10). In contrast, methylprednisolone treatment from day 3 provided partial protection (Figure 9, B and C, and Supplemental Figure 10). The blood laboratory test results of the rats were consistent with these results (Supplemental Figure 11). Podocyte loss has emerged as a central pathomechanism underlying glomerular injury and sclerosis.30,31 Although multiple signaling pathways have been implicated in podocyte apoptosis, which is one of the major causes of podocyte loss,32,33 the mechanism underlying podocyte apoptosis remains incompletely understood. 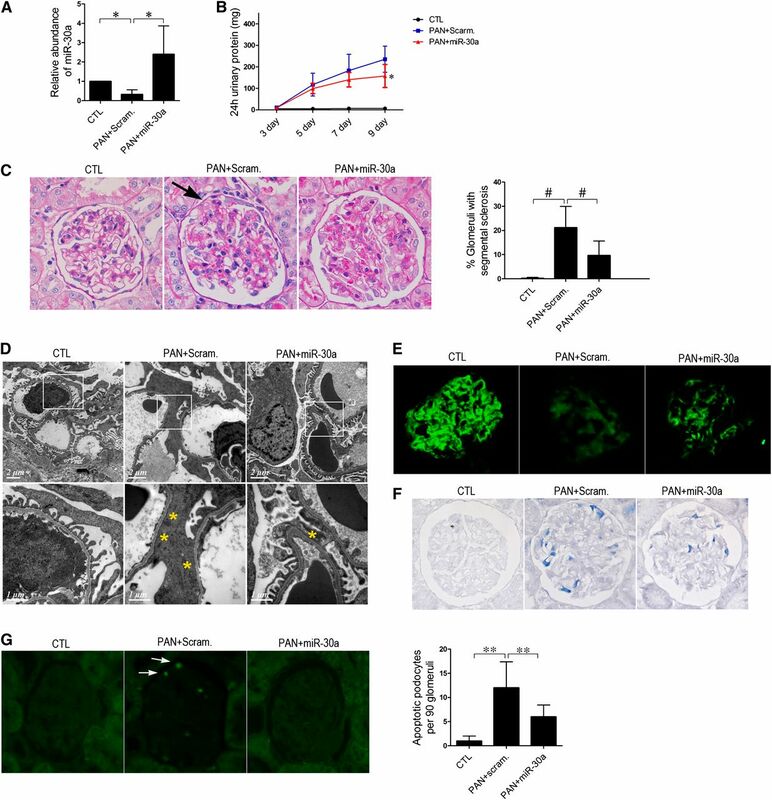 In this study, we report that miR-30s are significantly downregulated in the glomeruli of patients with FSGS and in cultured podocytes treated with deleterious factors, such as TGF-β, PAN, and LPS. Downregulation of miR-30s facilitates podocyte apoptosis by enhancing the Notch1 and p53 signaling pathways. We further demonstrate that glucocorticoids can sustain miR-30 expression levels in podocytes. Abundant expression of miR-30 in normal podocytes and their downregulation in the podocytes of patients with FSGS suggest that miR-30s may play a role in podocyte injury and be clinically relevant. Our bioinformatics analyses of predicted targets of miR-30 suggested that miR-30s may target several pathways known to mediate podocyte injury. This prompted us to explore the role of miR-30s in podocyte injury. Through both gain-of-function and loss-of-function assays, we demonstrated that miR-30s protect podocytes from apoptosis and cytoskeletal injury in cultured podocytes and in an animal model. The fact that miR-30s can prevent podocyte injury induced by various deleterious factors, such as TGF-β, PAN, and LPS, suggests that miR-30s may affect the common players in the apoptosis induced by these distinct reagents. On the other hand, the protection of podocytes by maintaining miR-30a was not complete (Figures 3, A and B, and 8, B and C), which may suggest the presence of alternative podocyte injury pathways other than Notch1 and p53. One may question the actual protection of podocytes conferred by miR-30s in kidneys because all miR-30 family members seem to be easily downregulated by TGF-β, PAN, or LPS. We believe that miR-30s may exert their role in maintaining podocyte homeostasis under conditions in which the stimuli either are relatively gentle or do not sufficiently downregulate miR-30s. This protection by miR-30s could be critical because podocytes would otherwise be vulnerable to various environmental changes and stimuli, thus leading to injury. In fact, miR-30 knockdown caused an increase in the basal levels of apoptosis and cytoskeletal injury (Figure 4), supporting our argument that miR-30s are essential for podocyte homeostasis. TGF-β has been shown to induce podocyte apoptosis by activating Notch1,22 but how this occurs is unclear. 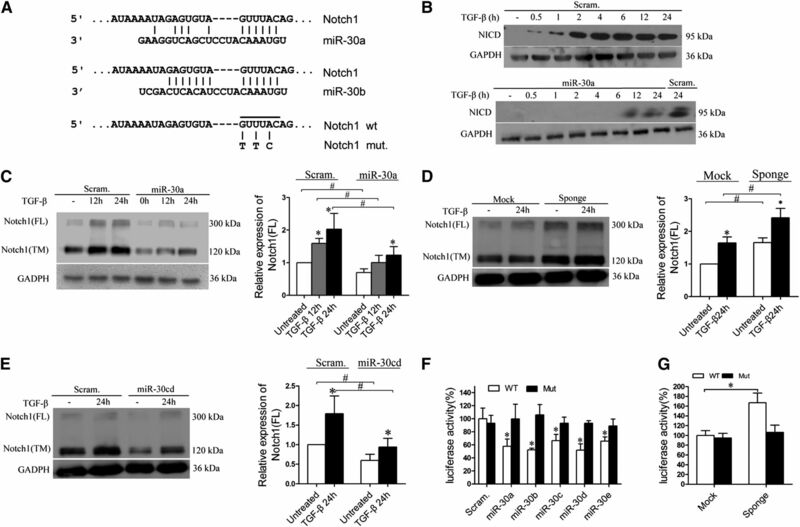 Our studies have linked TGF-β and Notch signaling through miR-30s in podocyte injury, i.e., Notch1 is normally inhibited by the abundant miR-30s in podocytes, but this effect is weakened and Notch1 becomes activated when miR-30s are downregulated by TGF-β, leading to podocyte apoptosis. The observed upregulation of p53 by TGF-β in podocytes can also be attributed to the downregulation of miR-30s. miR-30s were recently shown to directly target p53 in human cardiomyocytes to prevent apoptosis.15 Here, we demonstrated that this miR-30-targeting p53 pathway also operates in human podocytes and mediates their injury. Notch1 and p53 may not be the only targets through which miR-30s protect podocytes from injury. Delta-like ligand 4 (DLL4), a ligand for Notch receptors, was recently shown to be a target of miR-30.34 We show in Supplemental Figure 12 that miR-30a inhibited DLL4 expression in podocytes. This observation is not only consistent with the finding that DLL4 is a miR-30 target, but also suggests that DLL4 downregulation by miR-30s may contribute to the Notch signaling inhibition observed. On the other hand, connective tissue growth factor, a deleterious factor for podocytes35 that was shown to be a miR-30 target in cardiomyocytes,36 was not reduced by miR-30 overexpression in podocytes (Supplemental Figure 13). 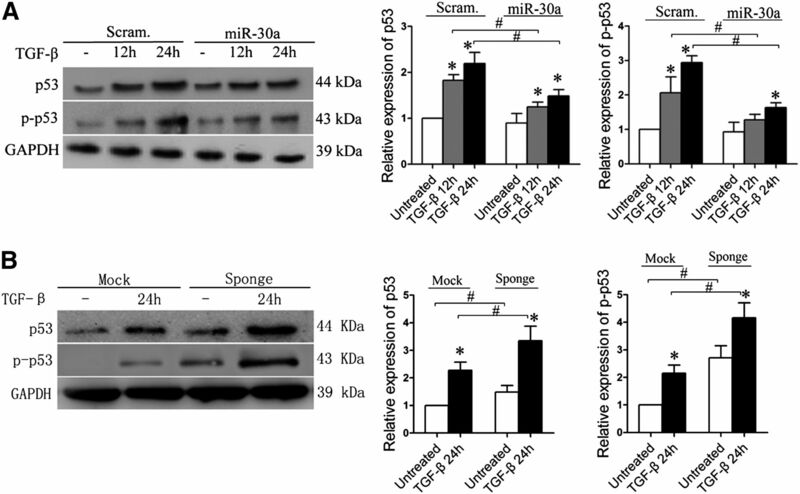 Moreover, miR-30 overexpression also did not reduce the expression of procaspase 3 (Figure 3E), which was shown to be a miR-30 target in glioma cells.37 Our observations suggest that connective tissue growth factor and procaspase 3 may not be miR-30 targets in podocytes and that miR-target pairing can be cell type dependent. Nevertheless, other predicted miR-30 targets remain that are associated with apoptosis (data not shown), and it is important to test their role in podocyte apoptosis. In addition to apoptosis, miR-30s also protect podocytes from cytoskeletal damage. Although we have not investigated the mechanism underlying cytoskeletal protection by miR-30s, the bioinformatics analysis of the predicted targets of miR-30s revealed an enrichment in components of the actin cytoskeleton pathway including MYH10, ARPC5, PFN2, ITGA5, MYH11, KRAS, CFL2, ARHGEF6, PPP1R12A, PIK3CD, GNA13, PIP4K2A, ACTC1, ACTN1, and ITGA4, suggesting that miR-30s may stabilize the cytoskeletons of podocytes by targeting one or more of these genes. It is unusual that all five miR-30 family members are concertedly downregulated, considering the fact that they are encoded by six distinct genes located in distinct locations on the chromosomes and presumably controlled by distinct promoters. There must be a common signal to which the promoters of all miR-30 genes respond, leading to inhibition of their transcription. Identification of this signal would aid in the development of novel drugs that target this signal and control the corresponding disease. This study shows that miR-30s are upregulated by glucocorticoids (Figure 7, A and B) but downregulated by TGF-β (Figure 2A) and play a major role in mediating the effects of glucocorticoids and TGF-β on podocytes. Other investigators reported the modulation of other miRNAs by glucocorticoids and TGF-β.38,39 Although the mechanism underlying the regulation of miR-30 by glucocorticoids or TGF-β remains unknown at this stage, our previous finding that TGF-β reduces miR-29a/b level in IAR20 cells through increasing the level of nuclear NF-κB p6540 may imply that TGF-β can also reduce miR-30 level via upregulating the NF-κB signaling pathway in podocytes. The therapeutic potential of miR-30s for podocytopathy is demonstrated best by the effect of glucocorticoids on miR-30 expression. The use of glucocorticoids is one of the main treatments for glomerular diseases, and previous studies showed that glucocorticoids have a direct protective effect on podocyte apoptosis.24,28 Specifically, glucocorticoids protect podocytes in part by inhibiting p53.24 However, the link between glucocorticoids and p53 is not understood. This study shows that miR-30s mediate p53 inhibition by glucocorticoids. In other words, the upregulation and activation of p53 are caused by deleterious factors that induce miR-30 downregulation; however, miR-30 levels are sustained in the presence of glucocorticoids, leading to inhibition of p53 signaling and apoptosis. Our present work thus reveals a novel mechanism underlying the effectiveness of glucocorticoids in treating podocytopathy. All 16 patients with FSGS were diagnosed by renal biopsy at the Research Institute of Nephrology, Nanjing University School of Medicine (Nanjing, China). The patients were selected on the basis of the following criteria: (1) proteinuria >0.4 g/24 h; (2) serum creatinine <3.0 mg/dl; and (3) free of obesity, diabetes mellitus, hepatitis, malignant tumors, and family history of kidney disease. Control patients with renal carcinoma exhibited no clinical features of kidney dysfunction, and their glomeruli were pathologically normal. The kidney samples used in this study were either the unused tissue remaining from kidney biopsies that had been collected for diagnostic purposes or obtained from surgical nephrectomies. More detailed information about these patients and controls is available in the Supplemental Methods. The protocol concerning the use of the patients’ samples in this study was approved by the Human Subjects Committee of Jinling Hospital, Nanjing University School of Medicine. Informed consent was obtained from all participants. The use of animals in this study was approved by the Institutional Animal Care and Use Committee at Jinling Hospital. Wistar rats (160–180 g) were used to generate a PAN-induced podocyte injury model. PAN (5 mg/100 g body weight) was injected into the rats through the left jugular vein. To express exogenous miR-30a in the podocytes of rats, miR-30a–expressing plasmid DNA was administered to the rats using a previously described hydrodynamic-based gene transfer technique with minor modifications.42 Briefly, 200 μg of plasmid DNA in TransIT-EE Hydrodynamic Delivery Solution (Mirus, Madison, WI) with a volume of 80 ml/kg was injected into a rat via tail vein in <12 seconds. To test the potential protective effect of glucocorticoids on the podocytes of PAN-treated rats, 15 mg/kg methylprednisolone was intraperitoneally injected to the rats every day. Human podocytes were cultured as described.43 The podocytes were treated with 5 ng/ml TGF-β, 50 µg/ml PAN, or 10 µg/ml LPS. For transient transfection, Lipofectamine 2000 was used following the manufacturer’s instructions. To make a cell line that stably expresses miR-30a, miR-30a expression construct DNA was transfected into podocytes followed by selection with hygromycin. Genomic DNA fragments containing miR-30 precursor sequences were prepared by PCR and cloned onto pEGFP-c1 (Clontech Laboratories Inc, Mountain View, CA) at the BamH I site downstream of the EGFP ORF. miR-30 Sponge, which contained five repeats of the cognate sequence of each miR-30 member, was synthesized and cloned similarly. The sequence of the synthetic miR-30 Sponge is available in the Supplemental Methods. Predicted miR-30 targets were obtained from TargetScan (http://www.targetscan.org/) and PicTar (http://pictar.mdc-berlin.de). Ingenuity Pathway Analyses software was used to predict the functions of miR-30s (http://www.ingenuity.com). Cultured podocytes were subject to small RNA or total RNA extraction after treatment using the mirVana miRNA extraction kit (Ambion). The RNA samples were used for miRNA quantification by a qRT-PCR kit (Takara Bio, Otsu, Japan). The primers specific for mature miR-30a, miR-30b, miR-30c, miR-30d, and miR-30e were purchased from Qiagen. U6 RNA or 5S rRNA was used for normalization. F-actin was stained using rhodamine-labeled phalloidin, and the resulting confocal microscopy images were digitized. Rhodamine-stained areas of actin fibers were converted to black pixels and then inverted and quantifed using ImageJ software (National Institutes of Health, Bethesda, MD). Grayscale values ranged from 0 (black) to 200 (white, the maximal actin content). The mean podocyte actin per pixel and total actin content per cell were calculated and expressed using arbitrary units. The 3′-UTR of Notch1 was obtained by PCR using human genomic DNA and inserted downstream of the pGL3-promoter (Promega, Madison, WI). Site-directed mutagenesis was conducted to create mutations in the region corresponding to the miR-30 seed. The resulting constructs were cotransfected with Renilla luciferase into podocytes using Lipofectamine 2000. Twenty-four hours later, cell lysates were prepared and subjected to luciferase assays using the Dual-Luciferase Report Assay System (Promega). The firefly luciferase activities were normalized to the corresponding Renilla luciferase activities. Cell lysates were prepared with radioimmunoprecipitation assay buffer containing protease inhibitor cocktail (Roche, Indianapolis, IN) and phosphatase inhibitor. The blots were incubated with primary antibodies against full-length Notch1 (Abcam, Cambridge, UK), Notch1 intracellular domain (Val1744 from Abcam), p53, phosphorylated p53, p38, and phosphorylated p38 (all from Cell Signaling Technology, Beverly, MA). After the treatment, podocytes were collected, washed with ice-cold PBS twice, resuspended in 200 μl of binding buffer, and then incubated with FITC-conjugated Annexin V at a final concentration of 0.5 μg/ml at room temperature for 15 minutes. The cells were then washed, centrifuged, and resuspended in 500 μl of binding buffer. The cells were stained with propidium iodide at a 50 μg/ml concentration at room temperature for 5 minutes, followed by analysis with FACScan using Cellquest software (Becton Dickinson, Franklin Lakes, NJ). Podocyte apoptosis was detected by TUNEL assays using the In Situ Cell Death Detection Kit, POD (Roche). miRNA LNA probes were purchased from Exiqon. Human renal biopsies were fixed with 10% formaldehyde and incubated with 18% sucrose in PBS overnight at 4°C. Kidney sections (15 μm) were cut and incubated with LNA miRNA probes labeled with digoxigenin at 55°C overnight. After wash, kidney sections were incubated with antidigoxigenin antibody conjugated with alkaline phosphatase at room temperature for 3 hours, followed by color development with NBT/BCIP (Roche) as substrates. The data are presented as the mean ± SD. Differences between two groups were analyzed using the t test incorporated in Prism 5 software (GraphPad Software Inc, La Jolla, CA). P<0.05 was considered statistically significant. This work was supported by National Basic Research Program of China (973 Program, 2012CB517600 and 2012CB517606) and the Key Projects of the Natural Science Foundation of Jiangsu Province (BK2011020 and BK2012054). This article contains supplemental material online at http://jasn.asnjournals.org/lookup/suppl/doi:10.1681/ASN.2012111101/-/DCSupplemental. Can Biomarkers of Disease Activity Guide Treatment in FSGS?